Induction heating is a process used in countless applications and industries. But before you get started with your own applications for induction heating, it's useful to have a clear understanding of how the process works. Here's a quick FAQ to help you understand the basics of induction heating. 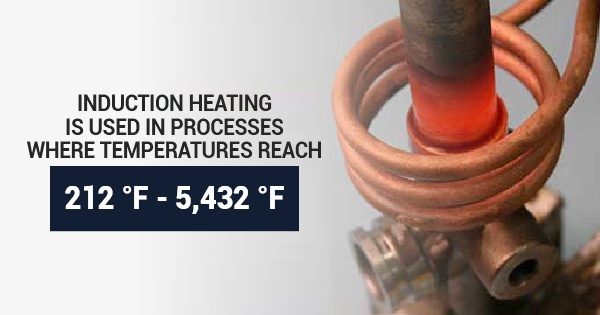 Induction heating is used in processes where temperatures are as low as 212 degrees Fahrenheit and as high as 5,432 degrees Fahrenheit. The process occurs when a material that has electrically conductive properties is set in an alternating magnetic field. As a rapid and non-contact form of heating, the current is induced directly into the part being heated. What role does the induction heating coil play in the process? The induction heating coil, also called the inductor, is one of the most important pieces of equipment needed for induction heating. It's custom designed to give your application the proper heating pattern and temperature as well as maximize the efficiency of the load matching system. Finally, the inductor maintains these processes while simultaneously allowing ease of loading and unloading. What are the main benefits of induction heating? Induction heating offers a number of proven benefits over traditional heating applications. First, its highly repetitive nature helps to maximize efficiency and ease of use. Its formulaic approach minimizes the risk of difficulties and improper use as long as the parts are introduced to the coil in a similar manner each cycle. Induction heating can also reduce or even eliminate the need for skilled operators in other applications such as induction brazing, which is a process where two or more materials are joined together by a filler metal that has a lower melting point than the base materials using induction heating. The overall ability that induction has to heat all components identically helps to automate and improve the process' efficiency. What are the main components of an average induction heating system? There are three main components that make up a typical induction heating system: the power supply, the induction heating coil, and a water-cooling source, which lowers the temperature of the coil and other internal components inside the system's power supply. Ultimately, understanding the technical components involved in the various applications for induction heating can help you make the best decision for your industrial needs. For more information about induction equipment, contact Ambrell Corporation.